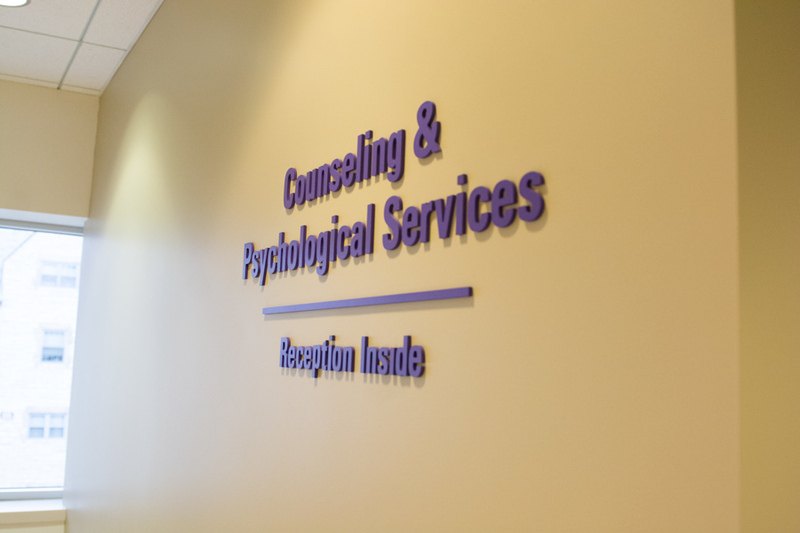 Counseling and Psychological Services, located on the second floor of Searle Hall. CAPS added Breathe, a meditation portal in the NUHelp app, to its stress management programming this year. Counseling and Psychological Services has expanded its stress management programming this year to include Breathe, a mobile portal featuring guided meditations for students. Breathe, which appears on the NUHelp app, features four subsections: stress response, test anxiety, sleep and one titled “I’m Overwhelmed” to reduce panic and increase positive emotions. CAPS psychologist Cindy McKinzie, who spearheaded the initiative, said CAPS started creating Breathe during Winter Quarter 2016, later unveiling it during Wildcat Welcome this September. Monika Gutkowska, a CAPS psychologist and assistant director for outreach and education, said it was important for CAPS to launch Breathe in time for the new academic year. CAPS will update the Breathe portal throughout the year with new programs to continue serving students, McKinzie said. She said updates will include a section for graduate and professional students, a section for students of color and a section dedicated to Body Acceptance Week in February. McKinzie said she wanted to make Breathe quick and easy to use to accommodate students’ busy schedules. The shortest meditation is about six minutes long, she said, and the longest, designed to help users fall asleep, is about 30 minutes. “Anything you can do for just a couple minutes here and there is going to reduce the impact of the stress response on your body and is going to increase that recovery response,” McKinzie said. She added that the program also aimed to incorporate the latest research on mind and body practices. CAPS psychologist and stress management clinic coordinator Henry Perkins (Graduate School ’91) said he has focused his work on issues of stress and anxiety for most of his career. Perkins said he has seen an increasing number of Northwestern students affected by these issues. In a 2016 survey, the American College Health Association found that nearly 62 percent of college students report experiencing “overwhelming anxiety,” an increase from about 50 percent in the 2011 survey. Perkins attributed increased stress to the pressure NU students place on themselves in academics and extracurricular activities. He said the Breathe program is a good way to keep stress management programming “current” and reach students more effectively. CAPS has also partnered with Calm, a mindfulness and meditation app, to give all NU students, staff and faculty free subscriptions for the 2017-18 academic year. CAPS also introduced MUSE, a neurofeedback device, to its programming this year. The device, currently available at CAPS stress management clinics and its drop-in resource center, tracks the brain during meditation and gives live feedback, Gutkowska said. She said the device teaches students how to meditate and how to “re-center” when stressed or distracted.